He won gold at the London Paralympics. Alex Zanardi once was a Formula One driver, who lost his legs in a horrific race car crash in 2001. Now he became a champion on the road again. He was competing in handcycling, a sport in which the bike is powered by the arms. "I'm certainly very, very happy, but this moment also brings a little bit of sadness because this weekend is going to be the end of a great adventure I've been fortunate enough to live." "You know, when you are in your 20s, you always believe that the race, that the championship is the only thing that matters. But then 20 years later, you say, 'Ooohhh, I remember when I was there with my mechanics, with my engineer, talking about the car, going out for a pizza, going to the team and (fixing) my seat and (spending) time with them. So you realize what really (matters) was the effort that you put in daily in order to build something special. Because when the championship arrives, you cannot expect to meet happiness that day, otherwise you don't get there. It's the process." "So I would imagine that probably a lot of people watching me doing (this) -- to some degree against all odds maybe -- they are going to say, 'Bloody hell, if Zanardi did this, I can try. 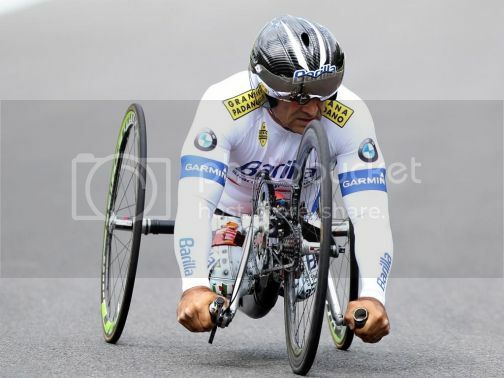 I can try,'" Zanardi said. "A good attempt always brings a result." "You cannot talk about dedication, sacrifice or stuff like that," he said. "You just do what you have to do because you love to do it." Incredible story.and a horrendous accident. He has a great willpower to go through such an accident and then come back, train again and win.